A few lovely bloggers- Wildernesschic, Looking Fab in your Forties and Everybody Says Don't did this on their blogs and I fancied taking part too!! Please also free to take part, it will be great if you do!! What you're supposed to do is to copy this entire post and paste into a new post on your blog. Change all the answers so that they apply to you.This is not a Meme or a Tag. You simply play along if you wish to. Or just read the answers! 1. Wrapping paper or gift bags? Wrapping paper generally!! 3. When do you put up the tree? It can vary, no real set date, but no earlier than the start of December!! 4. When do you take the tree down? 12th Night. 5. Do you like eggnog? Yes but I haven't had one for ages! 6. Favorite gift received as a child? A 9 carat gold chain when I was about 14, it was the style everyone was wearing so I was really pleased! 7. Hardest person to buy for? My mum, but I did well, as this year I bought her a fleece jacket from Marks & Spencer (which I've given to her already!) and she really likes it!! 8. Easiest person to buy for? My boys-its either a gadget or games, LOL!! 10. Mail or email Christmas cards? I haven't done either, just given in person!! 11. Worst Christmas gift you ever received? An apron-but it was a joke pressie!! 12. Favourite Christmas Movie? ELF! 13. When do you start shopping for Christmas? About the 2nd week of December!! 14. Have you ever recycled a Christmas present? Yes!! 15. Favorite thing to eat at Christmas? The usual Christmas turkey dinner with roast potatoes, brussels, etc- prawn cocktail for starters and Christmas pudding-so traditional!! 17. Favorite Christmas song? Christmas Carols. 18. Travel at Christmas or stay home? Staying at home. 19. Can you name all of Santa's reindeer? Only Rudolph and Blitzen-is it??? 20. Angel on the tree top or a star? An Angel-can you see?? 22. Most annoying thing about this time of the year? All the crowds of shoppers and the traffic getting into and out of town!! 23. Favorite ornament, theme, or color? My Angel and Robin, both on the tree. 24. Favorite for Christmas Dinner? Turkey. 25. What do you want for Christmas this year? To have a fabulous, happy Day!! 26. Favorite Christmas tradition growing up? Going to Midnight Service at Church. 27. Favorite tradition now? Eating Dinner and then relaxing for the rest of the day!! 28. Favorite Christmas Memory? Seeing Christopher unwrapping all his pressies as a toddler, while I stayed on the sofa under a duvet as I had the flu, LOL!! Wishing all my readers a Very Merry Christmas, wherever you are and whatever you do!! I take down my tree after the first Sunday of January. That's the Feast of the Three Kings so Christmas season in the Philippines ends that day. It was so much fun reading your answers - And your tree is lovely. Thanks for a more personal peek in to your space and life. I like your new profile picture, too! Merry Christmas and thank you for being an honest and "faithful" blogging companion. aw..love the tree. Funny, I like aprons..yet I don't cook..
My mom got the strangest present from a close friend this holiday. Chocolate wine. She's not even sure she wants to try it. Your tree has SR style! 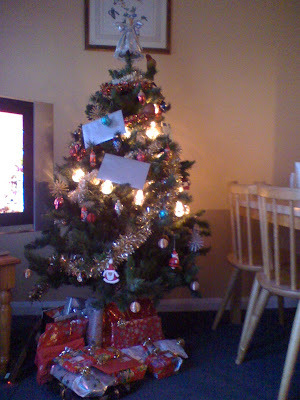 Aww I love christmas! I am so looking forward to good old turkey dinner! What a pretty tree. Merry Christmas. Love your honest answers. My husband rebuked me for trying to give my son's teacher the bottle of wine we won at the school summer gala for Christmas. So I have regifted too! Great post, Sharon! I wish you a wonderful Christmas with your family and friends. Hi everybody-thanks so very much for all your well wishes, take care and have a good Christmas!! Merry Christmas to you, Sharon!!! Love learning about your own Christmas traditions. Hope you are having a wonderful, wonderful day!